We have created langtang panorama trek to offer you the most scenic highlights of the complete Langtang mountains. The great panorama trek introduced the tallest mountains, wildflowers, mystical viewpoints, the rare endangered animal Red panda. Langtang panorama trek route is most scenic and the area is situated north of Kathmandu, the capital city of Nepal. The hike to Gosaikunda with its majestic lakes is just outstandingly beautiful. Majestic lakes and the Langtang Ganesh Himal range trek is delicate experience trek visiting every now and again by Nepali trekkers. Neighborhood people have been made present-day lodges with current workplaces in a huge piece of the spots. If you need me to state reality, I should express that you can add langtang panorama trek – 7 days or in 8 days with taking enough rest. You can cross Suryakunda hill and the glorious lakes in all months in all season. Climbing in winter time, for example, December, January, and February time, the lakes are frozen. There are more snow and the trail isn’t easy in the context of a sleeper, cold and wet, yet the guest houses are opening. Hike Lauribinala to Gosaikunda lakes gives an extraordinary motivating force awesome Mountain vistas, stunning scenes joining clean lodges with incredible necessities for existence. And because of promotion, this route is still less demanding in langtang region. As a result, Gosaikunda lake is an honored lake, a basic climbing venture objective for Hindus and Buddhist, therefore, various people visit this spot regularly. Other than that, you can climbs over moraine and stone rocks to Suryakunda lake 4,630m/15,140 feet and dive downhill strolling to Helambu region. Langtang National Park is the characteristic surroundings of a couple of wild animals, for a precedent, Himalayan mountain bear, Musk deer, Himalayan wild goat and particularly flying animals and wildflowers. Furthermore, at spring, the trail anchored with varieties of raised wildflowers and the forested areas are multi-shaded with brilliant rhododendron, orchids, magnolia, and various other organic species. Moreover, trek into the March, April, May and June mark as the best quite a while to visit in the spring season. The trail is clear and rich with grand Sun shinning climate. What’s more, September, October, November delivers the best time to visit too to the extent the best atmosphere. Climbing at gosaikunda pass is progressively awesome because of the best environment, momentous Mountain views, wild orchids sprouts, and clear lakes. Gosaikunda in those months, you can see different trekkers along the routes. Besides that, you will have the best point of view of Ganesh Himal (7,422 m (24,350 ft), Langtang Lirung (7,246m), Gangchhenpo (6,388m), Dokpu (5,930m), Naya Kangri (5,846m), Yala Peak (5,500m) and various others snow-topped mountains, intense rocks, verdant grounds, forested green valleys and similarly as sublime mountain lakes. Visiting Helambu trek is similarly mainstream for its characteristic magnificence and awesome atmosphere with sublime perspectives of glorious snow-shrouded mountains and just as Tibetan Buddhism culture. The territory is occupied by Sherpa and other ethnic gatherings having Buddhist Gompas. langtang panorama trek 7 days detail itinerary. Hike to Gosainkunda lakes and Suryakunda viewpoint includes the pristine glacial pounds along the rocky moraine trail until Suryakunda Phedi. Do not miss to get an excellent mountain vistas from Suryakunda hilltop. Crossing pass, you can walk downhill to get Phedi. The particular route is designed for world explorer who hikes over suryakunda pass with glacial lakes but is walking to get an adventure experience within a short span of time than this itinerary would be the best. Upon arrival in Kathmandu, Tribhuwan International Airport, we will receive you with private vehicle and transfer to hotel in Kathmandu within B/B plan. Our representative will give you briefing about your trip. Pickup the guest and start overland drive few minutes to catch up coach for Dunche Bazaar with your mountain trekking guide and porters. Enjoy six our scenic drive through Trishuli town (the headquarter of Nuwakot district) with beautiful tiny villages, river valley and mountains. The bus stops roughly about 30 minutes on highway restaurants for lunch in Trisuli. Then you reached Dunche bazaar around 2 o’clock midday. Stay overnight in a lodge. Day 3Trek ascend to Sing gompa / Chandan Bari (3,330m/10,890 ft) 5 hrs. We can start our hike through woods incorporates a considerable staircase to reach Deurali tea shop. During the hiking into the forest, we pass the woods of oak, hemlock, and firs. We reach at Chandanbari or Singompa around midday. Singompa is a wonderful little stop on the way, with bunches of pleasant inns and a DDC’s manufacturing plant where you can purchase Cheese. The vast majority take rest at Singopma and the following day rises to Lauribina take another stop before they reach Gosaikunda. We can see Langtang mountain extend including Ganesh Himal from here. Moreover, there is additionally a Tibetan Monastery on Sing gomba, intrigued individuals can visit there. We remain medium-term at hotel..
Trek constant towards Cholangpati, hike through the backwoods of Oak, Hemlock and Firs. At that point, we walk rise to the Lauribina la slope (3,920 meters) station where the best perspective of Gosainkunda lakes (4,460m. ), Himal Chuli (7,893m.,) Manaslu (8,156m,), Ganesh Himal (7,406m.) and numerous other littler snow secured mountains are hanging tight to see us. On a sunny morning, even the Annapurna range can be seen ascending delicately behind. Toward the north, we would see Langtang Lirung. Likewise, at Gosainkunda climbing, you can see a few frigid lakes. Among them, the significant three are Saraswati Kund, Bhairab Kunda and Gosainkunda are generally prevalent. As per a legend, Gosainkunda was made by Shiva when he punctured an icy mass with his trident to get water to extinguish his yearn for having gulped toxic substance. Our trail leads to the northern side of holy Gosaikunda Lake, crosses a moraine, passing three more small lakes; you will reach Laurebina La (4,610m / 15,121 ft). The trail descends to a National Park Post at Bhera Goth (4,240m) and to Phedi (3,740m). From Phedi the route drops and climbs through scrub bamboo to Dupichaur (3,630m) and descends finally to Ghopte. Stay overnight at guest house in Ghopte vir. Descending from Ghopte the trail makes several ascends and descends across moraines, then makes a final ascent to Tharepati observing the fine scenery along the path. Afternoon, hike to the view point to explore the whole Helambu village as well as the famous boarder Himalayas including Xisapangma (Above 8000 m). Stay overnight at guest house in Tharepati. From Tharepati the trail precedes passing through forests, to Magen Goth (3,420m). The trail descends through fir and rhododendron forest observing the view of beautiful and glittering peaks on its way to Khutumsang (2,450m). Thus, the trail descends to the delightful hill village of Gul Bhanjyang. Stay overnight at a guest house in Gul Bhanjyang. The trek proceeds with the forested edge moving to Thodang Betini (2,260m) and to Chipling (2,170m). Making an exceptionally steep plummet the trail heads to Pati Bhanjyang (1,860m), a Brahman and Chhetri town. At that point, the trail continues to Chisapani where you can be seen the mountain sees and the dawn over the Himalaya. Remain medium-term at visitor house in Chisapani. 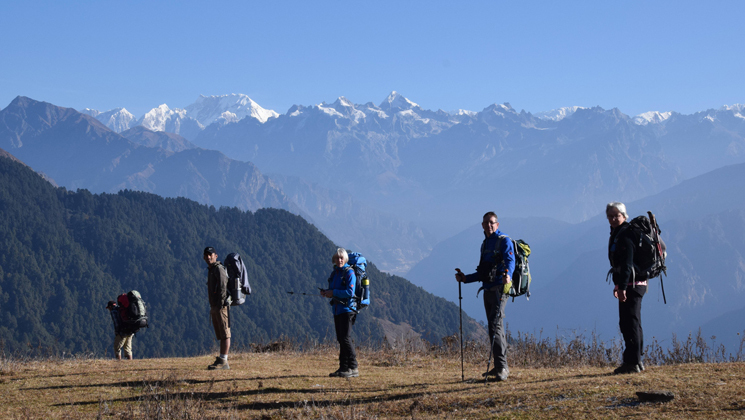 From Chisapani village, you can also hike to the best nagarkot panorama trek. Day 9Walk down to Sundarijal (1,300m). Drive to Kathmandu city center, 5 hrs. From Chisopani hill station, the route goes straight forward through the forest of oak and rhododendron and brings you to Borlang Bhanjyang. After a while, you will get to the Army check post where your Shivapuri entrance permit is checked, then to Mulkharka from where you will have a spectacular view of Kathmandu valley. Descending through the forest you will reach Sundarijal where there is a large water project. Furthermore, we drive out to the city center of Kathmandu. And at evening drop you to the TIA international airport KATHMANDU for your further flight. How much does langtang panorama trek 7 days cost? Hike to langtang panorama with Gosainkunda lakes pass 7 or 8 days is available now on USD 525 per person is standard trek price on double occupancy basis. But of course, the trip price will vary according to group size. For the deluxe and luxury trek tour plan, we add 3-star category hotel deluxe air-conditioned room in Kathmandu while on trekking on possible places. AND WE ARE OPEN TO CUSTOMIZE YOUR TOUR AND PACKAGES PRICE AS PER YOUR REQUIREMENTS. International tour leaders are highly encouraged to get discount and attractive complimentary according to the group size you are coming with. 1 night twin sharing tourist standard accommodation in Kathmandu within breakfast plan. Kathmandu to Syabrubensi & from Sundarijal to Kathmandu by bus transfer as per itinerary. We can organize a exclusive private trip Gosainkunda pass trek starting at any date that works for you. Please contact us for more information. Question: Do I need the experience to do langtang panorama trek? Question: What kind of accommodation can I expect on Gosainkunda pass trek? Answer: All the guest houses/lodges in Langtang trekking, they have attached restaurant and they cook a delicious range of mostly vegetarian such as Pasta, tuna bakes, noodles, potatoes, eggs, dhal bhat, bread, soups, fresh vegetables (variety depends on the season) The dinner and breakfast are provided in the same lodge you spend the night every day and Lunch will be provided on the way to the next place where you are going. Question: What opportunities will I have for a shower along express Gosainkunda trek? Question: How do I get drinking water on langtang panorama trek? Answer: All places offer nice lodges and shops where you can able to buy mineral water and you can buy it for drinking but however we advise against buying mineral water in plastic bottles, as currently there are no provisions for disposing of these. Instead, we provide you with boiled water or bringing chlorine tablets to purify the normal water as the normal water is available in campsite/along the way. Question: Is there any communication facilities on Gosainkunda pass hiking? Answer: Because our trips book up months in advance, we recommend booking early to avoid any kind of misunderstanding. We will, of course, make every effort to accommodate last minute bookings. And regarding the deposit, we prefer 20% advance deposit of the total price of the trip in order to confirm your reservation before you arrive in Nepal. And the rest of the payment can be made after your arrival in Nepal. Question: Who will carry my luggage on Gosainkunda pass trek? Answer: We provide porters to transfer your luggage. As we are a responsible trekking tour operator agency, each of our porters carry maximum 25 kilo of your backpack which means 2 guests (12.5 kg luggage of each guest): 1 porter basis. If you wish to have a private porter, you might also get it on paying an extra cost. Question: Do I need walking polls? Discover langtang Himalayas with Ganesh Himal families within eye catching view from Lauribina la hill station. Walk through fertile fields, colorful Rhododendron, conifers and oak trees. Best view of Mt.Langtag lirung, Langtag-ri, Langsisa, Langtang Himal … etc. Gosaikunda a pilgrimage tour / trek destination of Hindu devotees, located at 4,460m above sea level. Experience the Sherpa and other ethnic groups and their life styles. As the information about the trek stated above is just a guideline what we provide you, however, the trip can be customized at your request to accommodate your specific requirements. Local politics, landslides, weather, transport or a multitude of other factors that are beyond our control can result in a change of itinerary during on trip. It is, however, very incredible that the itinerary would be extensively altered. If alterations are necessary than we decide the best alternative option, taking into consideration the best interests of the whole group. Where a change does occur, we do everything we can to minimize its effect, but we cannot be responsible for the results of delays. Opportunities for challenging trekking or hiking and pleasant strolls are scattered all over this planet; you just need to know where to find them. We at Gokyo Treks and Expedition believe in the quality services. Your safety and satisfaction is our main concern. We are a team of professional, experienced, well trained and licensed local guides who know the destination better than others. Besides that, we give benefits to the local communities and helps to conserve natural resources through reducing costs and consumption. Brilliant hospitality, professional guides, best experience. My husband and I trekked to the amazing Langtang Panorama scenic trek in November 2016 with kamal our guide through Gokyo Treks and Expedition. Ammar organised everything for us with perfection. We stayed at Ammar’s home after arriving in Kathmandu. What a nice welcoming. We had an amazing time with our Trek guide who has almost 12 years experience trekking all over the Himalayas in Nepal and Tibet. We had such an amazing trip. Pictures can not give back the natural beauty of the Himalayas. It was amazing to be in nature far away from civilization. The trekking was hard but it was well worth the effort when we reached the amazing Langtang and Lauribina la. All the villages had simple lodges with great varieties of foods. I can not recommend enough Goyko Treks and Expeditions. Trip of the lifetime !! Thank you very much, Ammar and Kamal, for the amazing experience! – Heiner Uwe, Dusseldorf, Germany. My husband and I (in our 60’s) did the Langtang Valley trek with our daughter (age 28) in early November. We could not have been happier with the trip, particularly our expert guide Kamal who became a friend by the trip’s end. He is patient, kind, knowledgeable and experienced. Couldn’t ask for anyone better! We also loved our porters Santosh and Sanjaya (on his way to becoming a guide). Both super friendly and helpful people with a great sense of humor and consistently positive attitude. Pretty sure the tone for the whole organization is set by Ammar Gunni, the team leader in Kathmandu, who promptly and patiently sent detailed answers to all our many emailed questions before our trip.